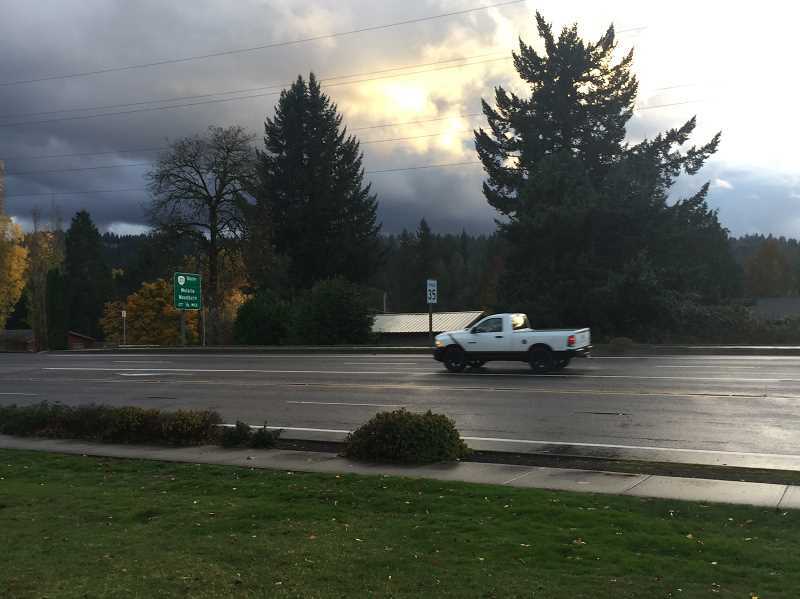 Those working on the city of Estacada's active transportation plan want to know what community members would think about a lane reduction on Highway 224. The potential reduction, proposed between Second Avenue and the Highway 211 bridge, would reduce the highway to one lane of traffic in each direction to allow for separated bike lanes and more opportunities for pedestrians to cross the highway. Missing sections of sidewalk along the route would also be added. "Hopefully it will move traffic away from sidewalks," said Melanie Wagner, assistant to the city manager and project manager for the active transportation plan. "(There wouldn't be) traffic blowing right past you as you walk on the sidewalks." The proposal for Highway 224 is one of eight opportunity routes under consideration by the city's active transportation team, which consists of a public advisory committee, technical advisory committee and several consultants. The goal of the routes is to increase opportunities for walking and biking around town. Community members are encouraged to provide feedback about the proposed routes at an open house, scheduled for 5:30-7:30 p.m. Tuesday, Nov. 28, at City Hall, 475 S.E. Main St. Those interested will also be able to provide feedback online for several weeks following the open house at City Hall. "(The process) is all really dependent on feedback from the community," Wagner said. "If there's (an opportunity route) they just take off the table, it won't be in (the plan). We want it to be a practical plan and something that just doesn't sit on the shelf and gather dust." Other proposed projects include a protected bike lane on Southwest Second Avenue, intersection crossing enhancements on Southeast Sixth Avenue and Southeast River Mill Road and filling in missing sections of sidewalks in various locations around town. To view all proposed opportunity routes, visit http://www.cityofestacada.org/cityhall/page/learn-about-estacadas-active-transportation-plan and click on "Potential Facility Types by Route." Earlier this year, the city received a $134,000 grant from the Oregon Department of Transportation to create a full-length active transportation plan. Previously, there were two chapters dedicated to walking and biking in the city's transportation system plan. Active transportation refers to any instance of people transporting themselves under their own power, such as through biking or walking. The plan will outline 20 years of projects and will be considered by the City Council next summer. Prior to that, there will be another open house for community members to share their thoughts in the spring. Wagner emphasized the importance of feedback from Estacada residents. "What's good for any random community isn't what we're after," she said. "Sometimes you might have to give up parking on a certain street if you want to have a bicycle lane that's separate. But what's more important?" "This all started because kids can't walk and bike to school safely," she said. "It's for our community first. It will make a lot more connectivity and make it easier for people who live relatively close to walk to a store or walk to a restaurant. We want to improve people's quality of life here, and how they can get around the city." City leaders will host a Community Open House to discuss poetential walking and bicycling improvements for Estacada's Active Transportation Plan from 5:30-7:30 p.m. Tuesday, Nov. 28, at City Hall, 475 S.E. Main St.
For more information about the city's active transportation plan, visit www.cityofestacada.org/cityhall/page/learn-about-estacadas-active-transportation-plan.